For other people named Archibald Douglas, see Archibald Douglas (disambiguation). Archibald Douglas (1390 – 26 June 1439) was a Scottish nobleman and General during the Hundred Years' War. Douglas was the son of Archibald Douglas, 4th Earl of Douglas and Margaret Stewart, eldest daughter of Robert III. He was Earl of Douglas and Wigtown, Lord of Galloway, Lord of Bothwell, Selkirk and Ettrick Forest, Eskdale, Lauderdale, and Annandale in Scotland, and de jure Duke of Touraine, Count of Longueville, and Seigneur of Dun-le-roi in France. In contemporary French sources, he was known as Victon, a phonetic translation of his Earldom of Wigtown. He fought with the French at Baugé in 1421, and was made count of Longueville in Normandy. He succeeded to his father's Scottish and French titles in 1424, though he never drew on his father's French estates of the Duchy of Touraine. Douglas served as ambassador to England in 1424, during the ransoming of James I. He also sat on the jury of 21 knights and peers which convicted Murdoch Stewart, Duke of Albany and two of his sons of treason in 1424, leading to the execution of Albany and the virtual annihilation of his family. Following the murder of King James I of Scotland at Perth in 1437, Douglas was appointed Lieutenant General of Scotland, and held the office of Regent, during the minority of James II until to 1439. Douglas died from a fever in Restalrig, Midlothian, and was buried at Douglas. 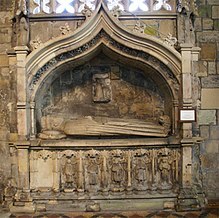 Between 1423 and 1425 he married Lady Eupheme Graham (before 1413–1468), daughter of Patrick Graham, de jure uxoris Earl of Strathearn and Euphemia Stewart, Countess of Strathearn. They had three children. Both sons were summarily beheaded at Edinburgh Castle on trumped up charges, in the presence of the child King James II. The so-called 'Black Dinner' thus broke the power of the 'Black' Douglases. The lordships of Annandale and Bothwell were annexed by the crown, Galloway to Margaret Douglas, and the Douglas lands and earldom passed to William's great-uncle James Douglas, Earl of Avondale, who was himself implicated, with Sir William Crichton, in the murder of the young earl. This article incorporates text from a publication now in the public domain: Chisholm, Hugh, ed. (1911). "Douglas" . Encyclopædia Britannica. 8 (11th ed.). Cambridge University Press. pp. 442–444. This page was last edited on 5 October 2018, at 05:40 (UTC).